So it all comes down to this. 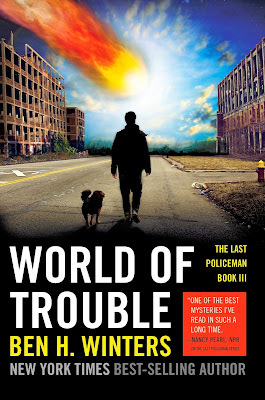 Ben H. Winters' brilliant trilogy comes to a cataclysmic end with "World of Trouble", the third in "The Last Policeman" series. I received the book for my birthday from my mother in law and I was almost too scared to start it. How could Ben possibly end the tale in a satisfying way? For those new to the series, the world is about to end. A giant asteroid is on a collision course with the planet and there's nothing we can do about it. No last-ditch attempt to blow it to smithereens with nukes, no plucky team of miners landing on it in a pimped up space rover. Nothing, just the inevitability of the catastrophic event and the gradual erosion of civilisation as people attempt to bunker down and somehow survive. People except Henry "Hank" Palace, our dogged and determined hero who is still playing detective even as the world around him descends further into chaos. In the third book Hank is on the trail of his wayward sister Nico, who has fallen in with a survivalist cult and disappeared. Hank is driven to finding her, perhaps through family loyalty or just the need to be close to someone you know at the end. But the path ahead is dark, even darker than the forthcoming cosmic event which will inevitably wipe away humanity as easy as swatting a fly. Hank is not alone. With his faithful hound by his side, and a not-so-faithful nefarious criminal in tow, Nico is tracked to an abandoned basement, reinforced with a huge concrete floor to cover...what? Time is running out, but partially to preserve his own sanity and partially to find out what has happened to Nico, Hank continues his own methodical investigation but will there be time to wrap up this one last final case before the end? Ben H. Winters has pulled off the achievement of maintaining the momentum of the series right to the very last page of this final book (which, obviously, I'm not going to spoil for you). With each plot twist and turn, the book has you asking of yourself the same questions Hank asks. What do we, as humans, hold dear to us? What drives us? Why do we do the things we do? The grand backdrop on which this story plays out is the distraction for what becomes, in essence, a story not about the cataclysmic collision but about humanity itself as each character we encounter in the story describes a particular human frailty. Obsession, greed, mistrust, envy and above all the essence of self preservation that each of us has right up until the very end, sometimes but not exclusively at the cost of others. So now there's a huge gaping asteroid-sized hole in my life now the series has come to a close. If you want to experience a three-book-journey into the darkest corners of your own character, then "The Last Policeman" and its two stable mates will deliver that in spades.